Record every discovery in your wine journey and save the labels. Comes with 10 label savers That '82 Bordeaux, '94 Napa Cab, and 75 other wines you've tasted live on in this handsome journal from Italy. 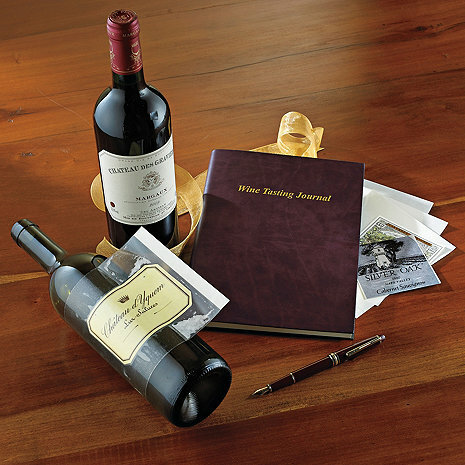 Jot your notes down on ivory-colored bond paper, and paste your wine labels as lasting mementos. Entry descriptors (vintage, taste, etc.) are in English and Italian. With burgundy bonded leather cover and gold ribbon marker. 155 pages. How many listings of wine does it hold? BEST ANSWER: Whatever you want it to be, there are 155 pages, you jot doen the wines and attach the wine labels to the pages. My son absolutely loved this combined gift, thought it was really different.Great product! Very nice. Comprehensive. Attractive. Solid. Well worth the $20-30 premium vs. something cheaper from other retailers. Great job wineenthusiast.com !! Will be back. I purchased this s for my daughter's birthday, which has not yet occurred. Great for recording the essential elements of a wine. Perfect for the purpose.